Modernism is inextricably bound up with the historical period of its genesis. It is a reaction to a world where the goal posts have abruptly moved. The industrial revolution was the historical event, but its effects only became overwhelming in the 1840’s and later when it impinged upon every part of life in the countries initially effected. The driver was of course the successes of scientific thought. A systematic investigation of the natural world had resulted in a seismic change. It is perhaps impossible in our age to understand how slow the evolution of society was before that point. There had of course been waves of religious ideas causing turmoil, wars and the other frictions from populations rubbing up against each other. Everyday life had however hardly changed. Its pace remained constant tied to the turning of the seasons. A medieval person would have noticed changes if moved to the 18th century, but perhaps not ones that ran very deep. The age of manufacturing and mechanised transport changed all of this. Previously intellectual changes had only effected the upper reaches of society and the higher echelons of the church, but had left the bulk of the rural population unchanged. The industrial revolution however uprooted whole swathes of the poor and put them into a whole new circumstance. It also vastly enlarged the middle classes as new areas of expertise were created. No longer just the blacksmith, the tanner, the joiner and the cooper, a whole new set of trades and associated skills appeared. These new occupations had no prior traditions and were evolving year by year which was an entirely new thing. Many in this new group of consumers were fascinated by new discoveries and the world outside their everyday environment. Artists responded to this by supplying imagery of far distant lands and the curiosities they contained. Painters still painted subjects from legend and history, but with less and less confidence. Slowly that content withered and as we see with Turner and before him Claude, is finally overwhelmed by the imaginary stage sets that used to be merely the settings for classical dramas. There were of course romantic yearning glances into the rear view mirror, such as the Pre Raphaelites, but in a way they only reinforced the conviction that those days were gone forever. Having mostly adapted to the disruption caused by the cheap reproduction of imagery the arrival of photography meant that the painters and their purpose to society were finally and irrevocably undermined. The result was a wild and exciting attempt to remake art. It was going to serve a new world. It was going to carve a niche for itself in tandem with mass production. It was going to supply the intellectual and spiritual grist to the industrial mill. The only problem being that industry did not feel the same way. If you look at the writings of the time many seemed to believe a new and better world was to be made from the old. We still pretty much have those beliefs today although they are becoming strained. Change was to do its work and then plateau and have an end in a new and improved world for all. We have modified this a little to a dream of sustainability and living in a new harmony with the planet and each other, despite it being against all the rules that govern living things. Evolution requires that any creature that gets the upper hand multiplies until it runs out of resources or something more potent evolves. During this time there came the idea of constant revolution. First imagined by political thinkers to prevent any future subjugation of the workers by capitalist forces, it has slowly become our everyday life. We are slowly waking up to the realisation that change is never going to settle down into a new equilibrium, or not one we will survive. So change itself becomes the only unchanging thing. Modernism was perhaps expected to become the new vernacular. A better and more rational way of doing things that would sweep away the superstition and inertia of the old order. It was to gain something from the methods of science. Individual areas could be examined and explored. As with Newton splitting light the components of art could be separated out into elements, examined and a new understanding reached. So artists could take colour, feeling, form, narrative or any other possible attributes of an art object, as their central subject. In architecture and industrial design the science overwhelmed the art. Buildings are practical things with budgets and many other constraints. Modern architecture might be labeled modernist, but might be better termed as pragmatist. Due to their importance as personal status objects cars and electronic devices are perhaps the most successful blending of art and science, they may perhaps be what is placed in the art galleries of some distant future. Whatever we make it is about the “now” speaking to the times yet to come. Should we think of art as a radio station transmitting to the future? All art after all speaks the future in some way even if it is to the near future of the contemporary. A painting is made for the future gaze of another, in a similar way in which a flower blooms in the anticipation of the future attention of some hoped for bee. So the question for artists is maybe what sort of “flower” should we paint. We can look at previous blooms that have created a buzz and attempt to emulate their success, or we can make a new flower in the hope that it might just be the future bee’s knees. There is no answer of course, but it is an age where we can produce work in any manner we wish. Everything is old fashioned as soon as it is finished. There is no meaning left in the words, traditional, contemporary, new or indeed art. A change we perhaps haven’t yet quite caught up to is that the age of “-isms” and “-ists” is well on its way to being dead and gone. So what is to become of all the art we produce? Those who collect and deal in art and populate our galleries have no interest in quality. The works themselves are only tokens of symbolic value in a game of oneupmanship played by the wealthy. For this use indeed measurable parameters of quality are a disadvantage, a possible weakness that might be assessed and then criticised. You can call for change all you want but I suspect it will not happen. It is easy for art schools to train an artist with no skills or any future need for them. The art investment world and the subsidy bodies, both governmental and charitable, need work that is free of the potential for concrete appraisal. The relationship is mutually beneficial and I see no way it will end. The real art of our time may come from the commercial and amateur worlds, alas most will not reap much of a reward of either money or official recognition in their lifetimes. All artist’s work will from now on always be remembered though. There can be few painters who are not leaving a trail of digital images strewn across the internet. How this overwhelming tsunami of paintings past and present will effect the future is hard to say, but I begin to feel the result might be stagnation. I have been distracted by painting rather than blogging recently so a miss mash of paintings… to follow. 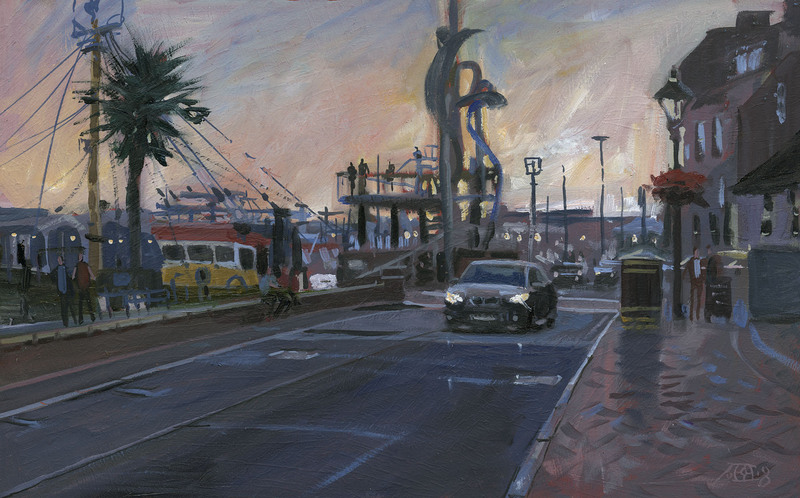 I have been concentrating on the oils recently with an eye to improving my compositional choices. I sometimes tend to go with the obvious view when faced with a scene to get down before the light changes. This is Poole Harbour and a glorious dazzling late afternoon. 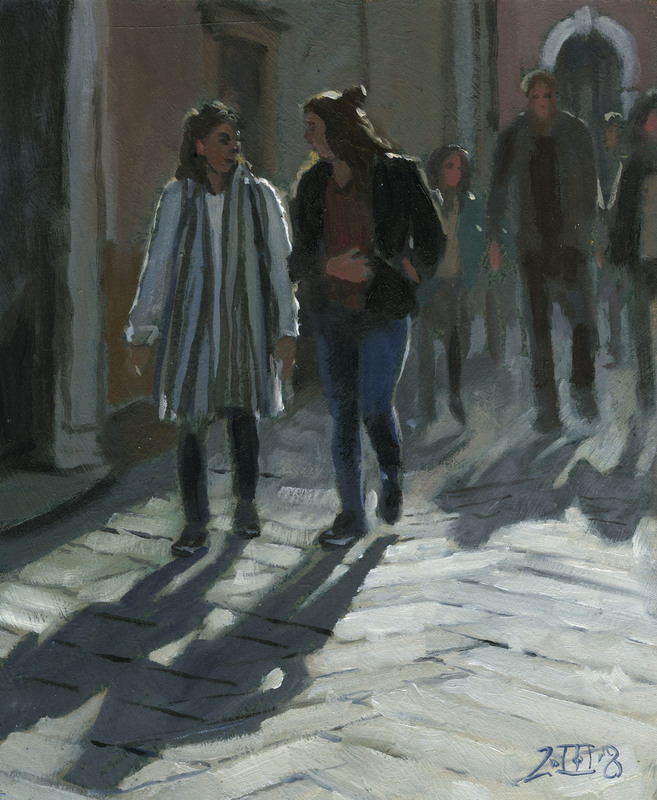 I spent an age getting the relationship between the pavement and the shadows to be thrown upon it right. If the pavement was too light then the highlighted strips would lack punch, too dark and the shadows wouldn’t describe the bright sun. 14in by 8in Oils. After fish and chips in the pub I set about this view. Odd how a very ordinary scene can be transformed by good light. Here I worked hard at getting the underlying tones in a good relationship that explained the time of day. 16in by 10in Oils. 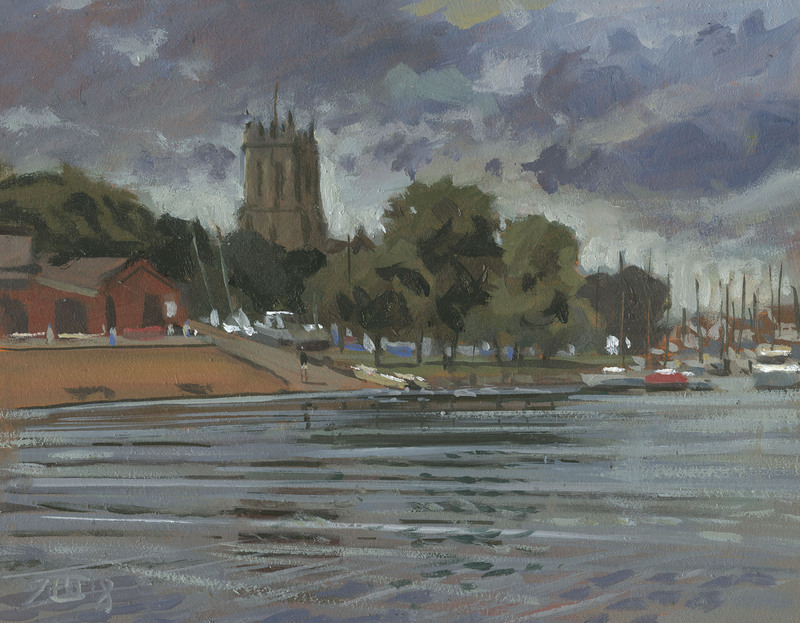 We were kindly invited to paint at Simon Gudgeon’s Sculpture by the Lakes with his sculptures set in an extensive park. The day was blindingly hot and bright with the sun high in the sky. Eventually I found this corner where the river Frome borders the gardens. 10in by 8in Oils. I was going to seek shade but I was attracted by a stone carver working near the cafe. The light was just coming over the steel wall and catching him in brilliant light. 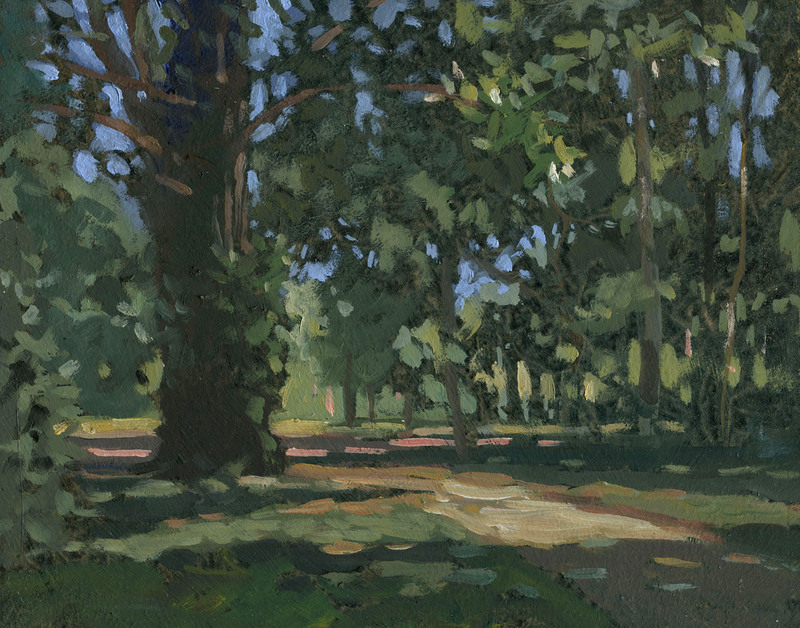 Very hard to catch this sort of subject en plein air so there was a fair bit of fiddling once I got home to get it to work properly. 10in by 8in Oils. I decided a shady spot was needed next so chose this simple view. I started on a dark blue grey board so most of the shadowed areas are left unpainted by using negative shapes. Great fun and I completely lost myself in it. 10in by 8in Oils. 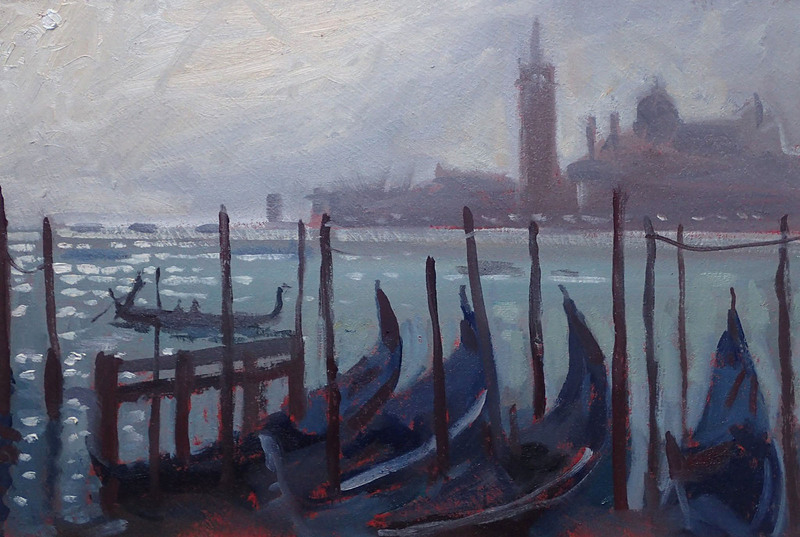 I had a few started but not finished paintings of Venice, so I spent a day trying to make something of them. This had a different figure in it and was rather boring. I had however taken snaps of passers by at the time so this lady with the lurid brolly took my fancy. Since I scanned it I repainted the background too so almost none of the original left! 6in by 12in Oils. 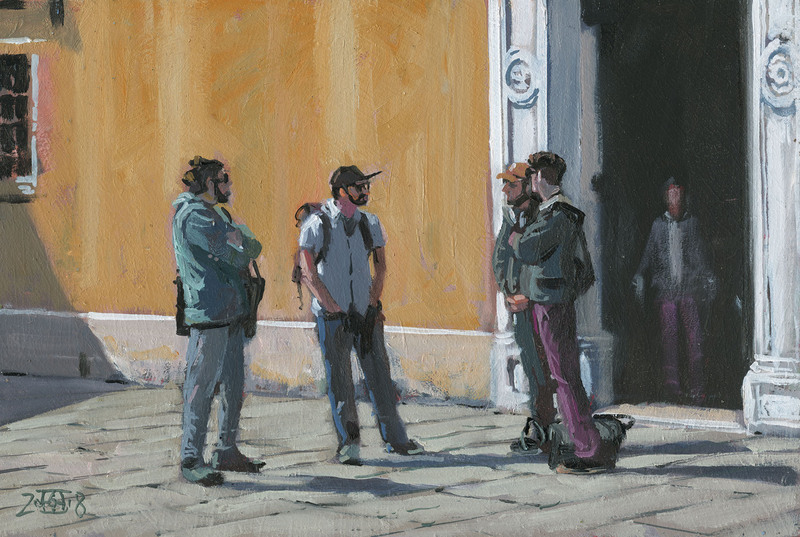 I was very taken by these 4 Venetian students chatting outside their college. I very quickly painted their silhouettes on the spot but they moved on too quickly for anything more. I was lucky really the stayed as long as they did. With my subject gone I filled in the background and had to finish the figures from phone snaps. 10in by 8in Oils. 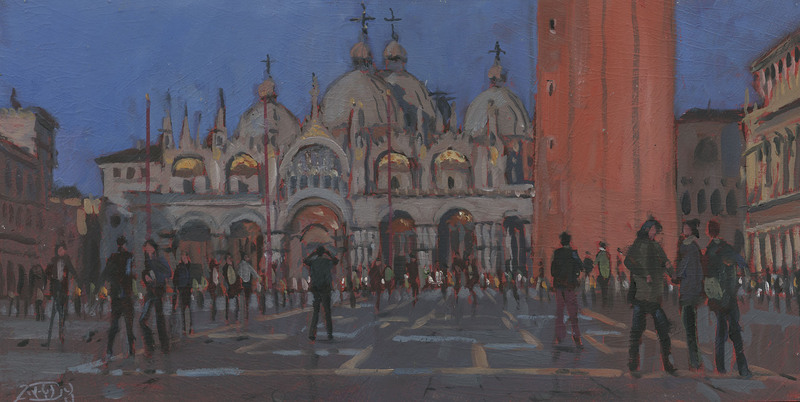 Another Venice one to finish off. I started this then realised it was just too busy where I was set up, so had to abandon. I had cribbed the figures from a phone snap any how so had the info to finish. This is what I started with. Here’s the end result, the main problem was not taking it too far and loosing the mood. 8in by 10in Oils. Something a bit different for me… I have been meaning to paint in my garden for a while. To find my subject I got an empty 16in by 10in frame and wandered about framing bits of random shrubbery until I found something I liked. Got a crick in the neck doing this though. I started on quite a dark ground and put in the brightest areas first. Then I added the darks and finally the greens and browns. It is important to remember to draw at each point, it is oh so easy to start slapping paint on with out getting full value out of the brushstrokes. 16in by 10in Oils. I found my next subject almost between my feet. I actually left the frame on the grass as it helped me see the tones. To do the grass I painted random dark negative shapes on my ground and then added a couple of layers of yellows and greens on top. 12in by 6in Oils. 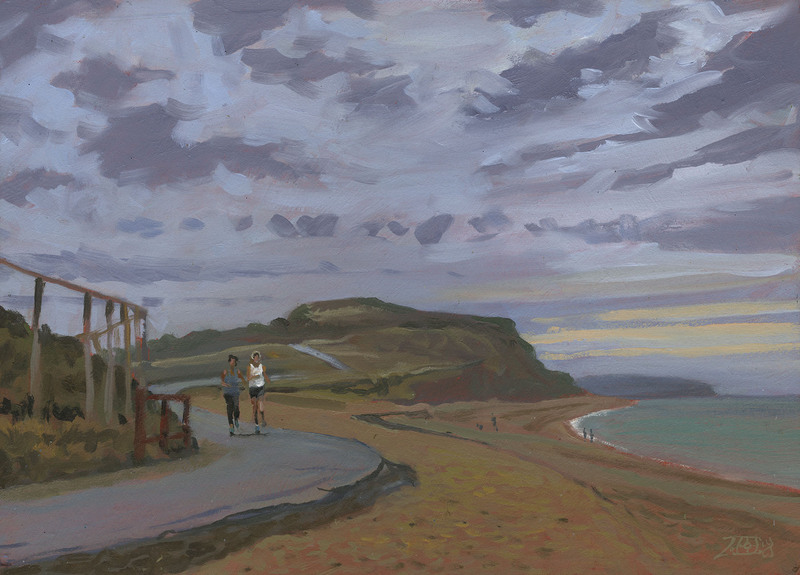 Let’s get up at dawn and go painting at Hengistbury Head… that was the plan. So 7in the morning staggering out on to the beach semi conscious to attempt to paint. The light was very soft and subtle so I didn’t jump straight in but thought it through a bit. The headland needed to be dark enough to stand forward against the sky but still not above a 50% grey in tonal strength. I loved the joggers and the dog walkers so just stood for while taking photos of them was they passed. Once home I settled on these two joggers which brought my strongest dark and brightest light together. 14in by 10in Oils. A pause for breakfast and then we explored the views of Christchurch priory from across the river. As I worked I hoped for a dash of light to hit the tower. 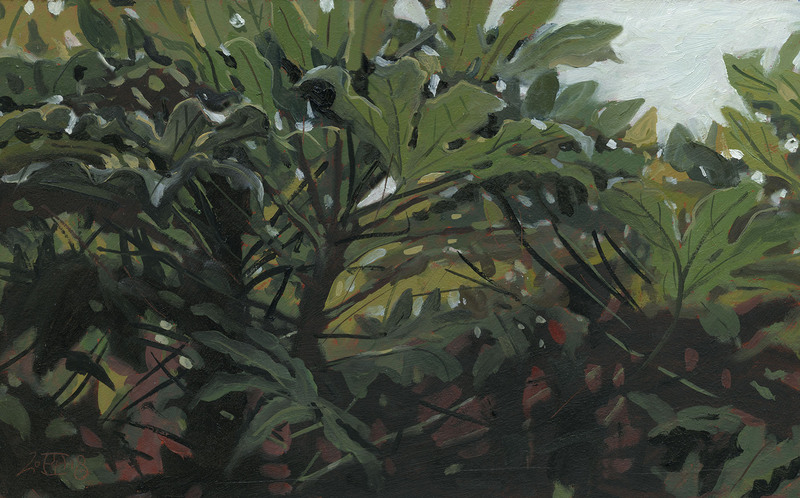 No such luck so I left it unlit… I could have made one up I suppose, but that would not be cricket… 10in by 8in Oils. Another view of the Priory from across the marshes this time. 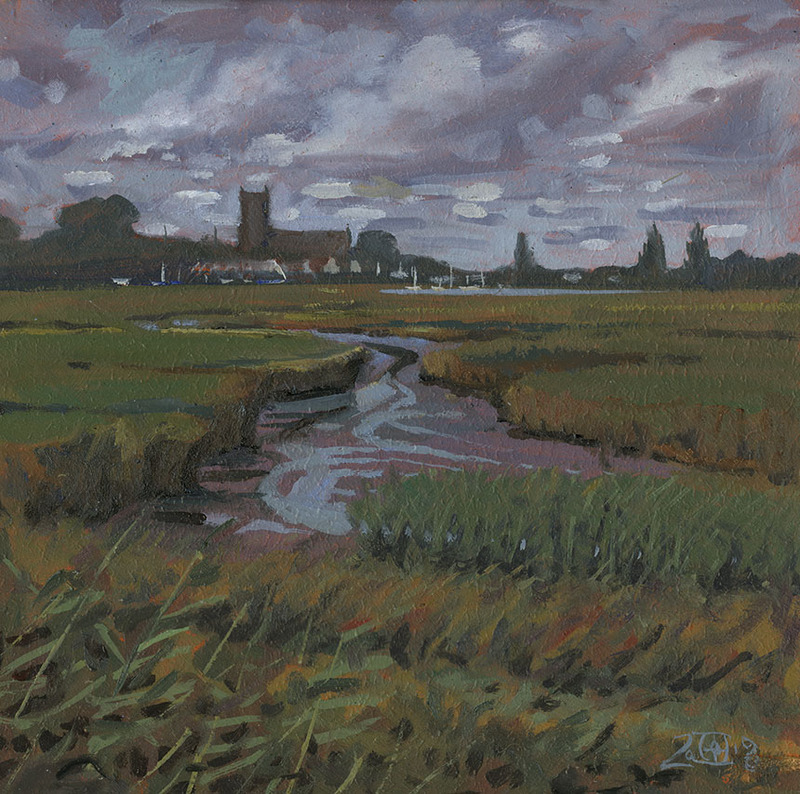 I must go back here to paint late in the evening as I suspect it would be lovely. The hard part here was organising all those pesky greens and not getting any of them too lurid. I have recently added an Emerald green to my palette instead of viridian which is a wee bit scary. Still is always interesting to change your palette around, too many painters always use the same set of colours which means their pictures tend to look similar in mood whenever or wherever they paint. 10in by 10in Oils. 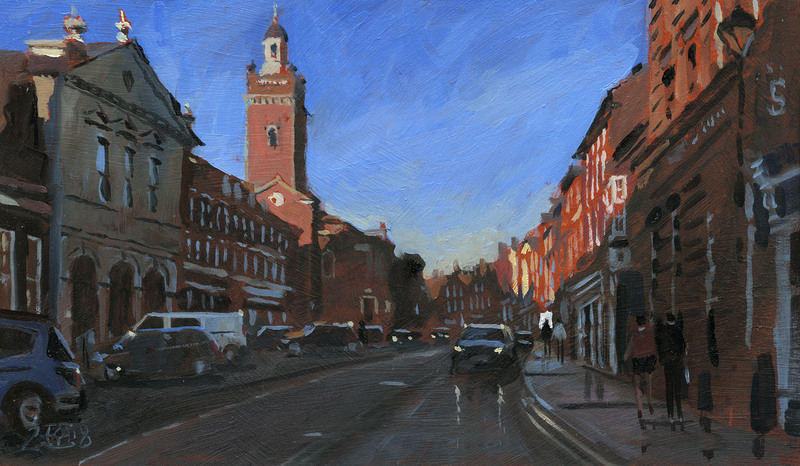 I was coming out from judging the local art show in Blandford Forum when I was greeted by this sight! I took a few phone snaps and went back a day or so later. I reckoned I would not have much time so I roughly drew it out on the board from my snaps and blocked in the whole of the buildings with a dark glaze. I’m glad I did because it was a real rush with the shadows climbing up the buildings at a terrifying rate of knots! 14in by 8in Oils. Venice. Like all artists I went there knowing it already. I wondered what I would make of it and if I could add anything worthwhile to the morass of artwork that takes it as a subject. Would I find the “real” Venice? The answer of course is no. There is no real Venice, Venice is a fantasy. Venice is a theme park and all the life that goes on there is devoted to the commercial maintenance and operation of the dream. Venice is a city wide tourist trap, a veritable sea girt Alcatraz for visitors to do their time in. A Venice street goes: mask shop, fake Murano glass shop, taverna, mask shop, restaurant, mask shop, fake Murano glass shop etc ad infinitum. After Napoleon conquered the city it slowly died until finally we are left crawling over it like flies admiring its beautiful corpse. There are legions of immigrant workers slaving in its kitchens reheating dishes shipped in each day from the factory kitchens on the mainland. In China they labour to make the masks, glass, paintings and other tourist trash. 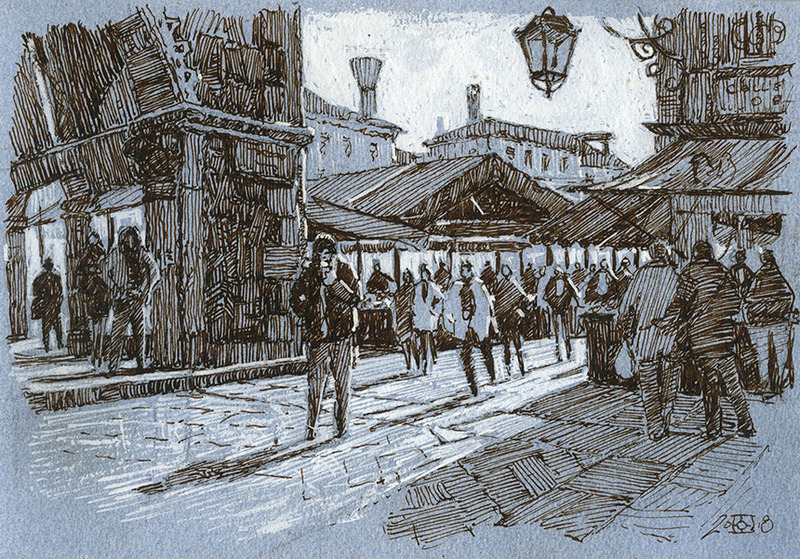 There is an imaginary transport system that never takes anyone anywhere but on circular tours… no one brings their shopping home by gondola! If I had been by myself I would have quickly done the rounds and been out of there pronto. Fortunately I was there with other artists and their company made all of the difference. The plethora of mask shops could be laughed at and the madness admired. I could rise early immerse myself in painting and join in with the fantasy. 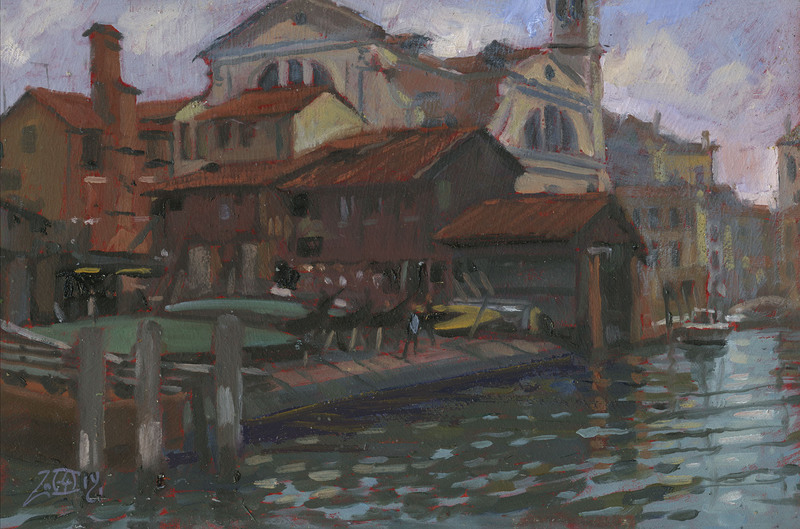 So how is Venice as a subject for an artist to paint? 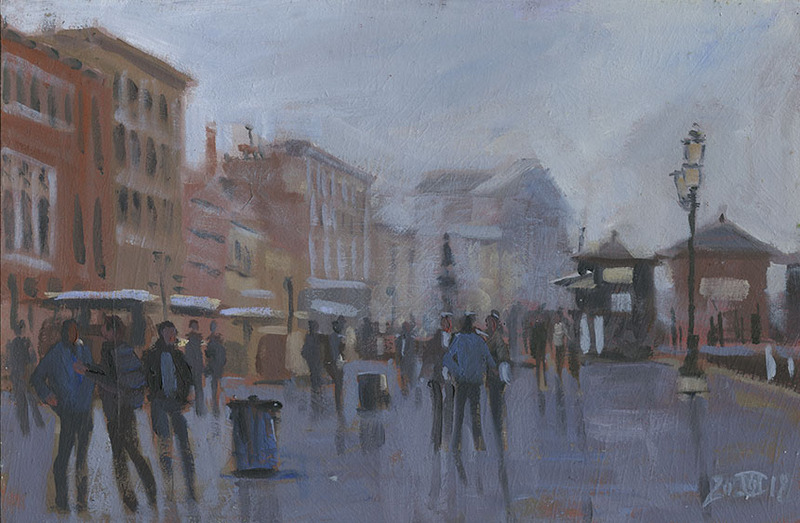 Firstly there are subjects everywhere, if you came across any of them in a town in the UK you would set up your easel in a flash and set to. 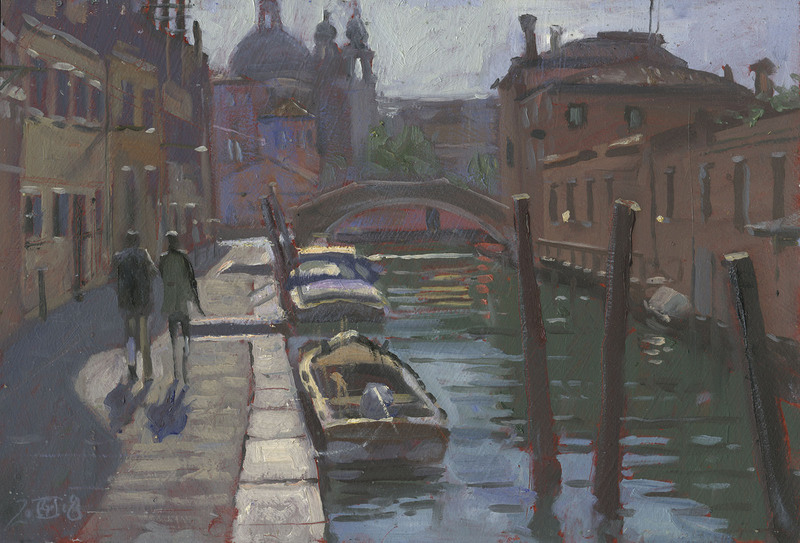 In Venice though every aspect and all directions are paintable. As Einstein said, everything is relative. You almost immediately start to rank the possible scenes and try vainly pick out the best of the best. 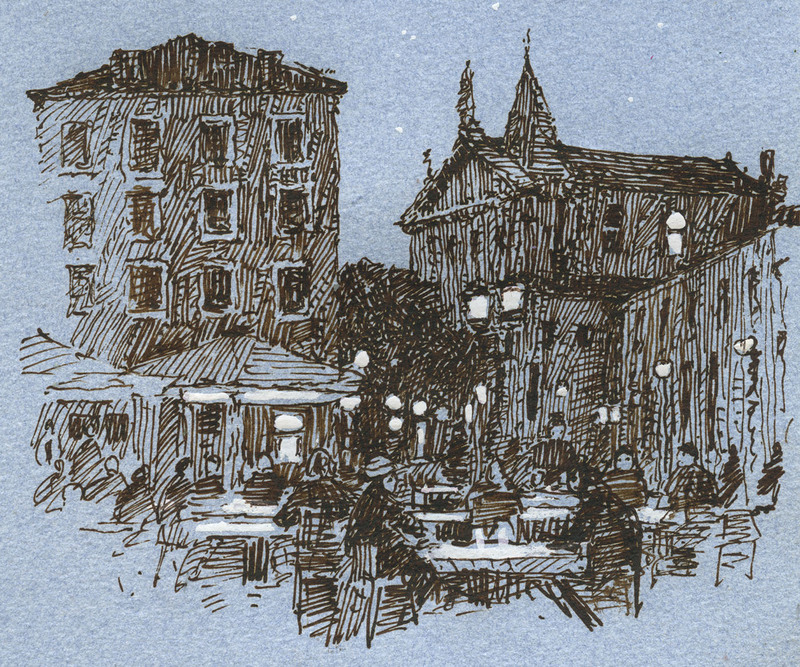 Venice is also all very similar, endless repetitions and rearrangements of the same few ingredients. Anyone who looks at my work will know my fondness for architecture and old buildings in general. In theory Venice is a cornucopia of perfect Rob Adams subjects, gothic palaces, mad baroque churches, cool classical facades and rustic mouldering buildings, roofs crowned snaggle toothed by random chimneys. Mostly though I painted legs. Visually the buildings reach down from the sky and are carried on the backs of the dark serried ranks of the innumerable visitors who obscure the join of buildings to street. I am told that it was quite empty by Venice’s standards, I shudder at how in must be in high season. On the other hand I love watching people and enjoy seeing how they group, linger and go about their day. I enjoyed the contrast between drifting tourists and workers on missions trying to weave between them. Oddly I did not really notice the absence of cars. I did warm to the place after a while, there is nothing intrinsically wrong with it just being a playground. The place reminded me of a computer game where you wander a city built by a long dead civilisation looking for clues and prizes while avoiding the ghouls hidden in dark passages. So to the paintings, I will try and do them in the order they were painted. Up early on the first day and off to the Rialto fish market. I was sharing the apartment with Ian Layton who is an old Venice hand who knew all the best spots! 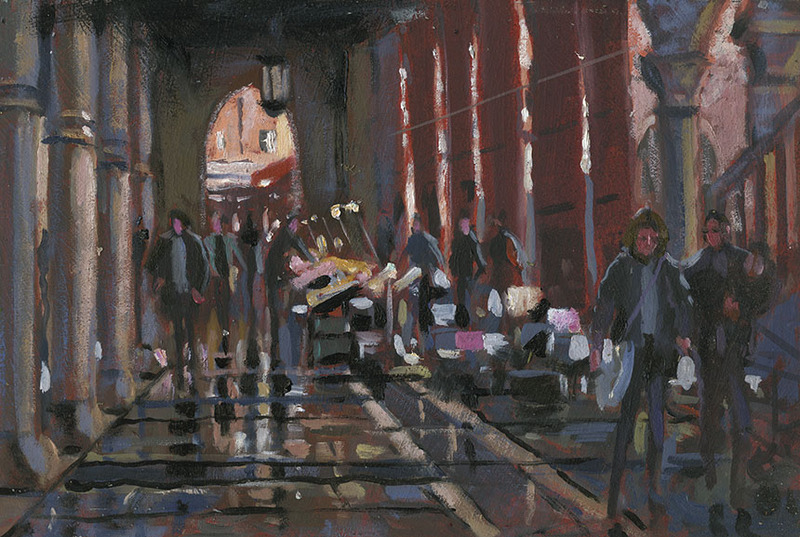 Quite a tricky subject, the light burning in from the outside is what struck me so I tried to paint that. I can see now that the effect needed to be exaggerated more with the interior darker and the outside almost completely burnt out. 12in by 7.5 in oils. On the way back from the Rialto we were taken by this scene where the sun was slowly coming across on to our side of the Grand Canal. I had primed my boards a sort of Venetian red which mostly just right, but I should have done a few a more ochre colour. Like so much of Venice the fringe of people ran in a strip all the way across. I quite liked the more determined folk leaving the vaporetto on the right contrasting with the moochers on the left. 15in by 7.5in Oils. Here is a very trad early morning Venice view. We were all painting away in a line getting spots on our retinas! 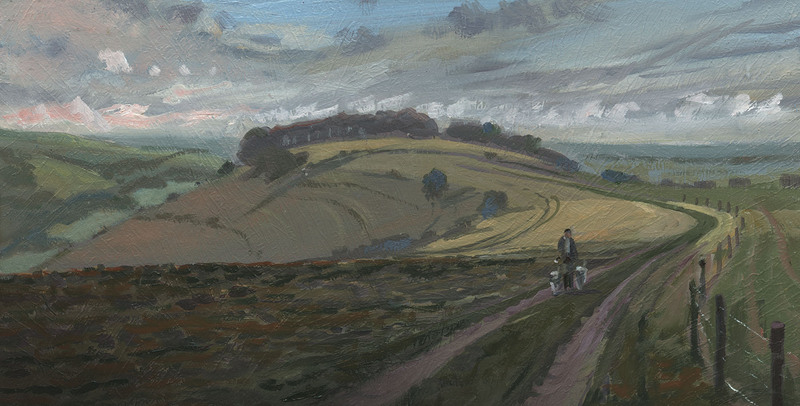 Once the key was decided and the tones established a straight forward subject to paint. The main pitfall people tumble into is getting everything initially too light. 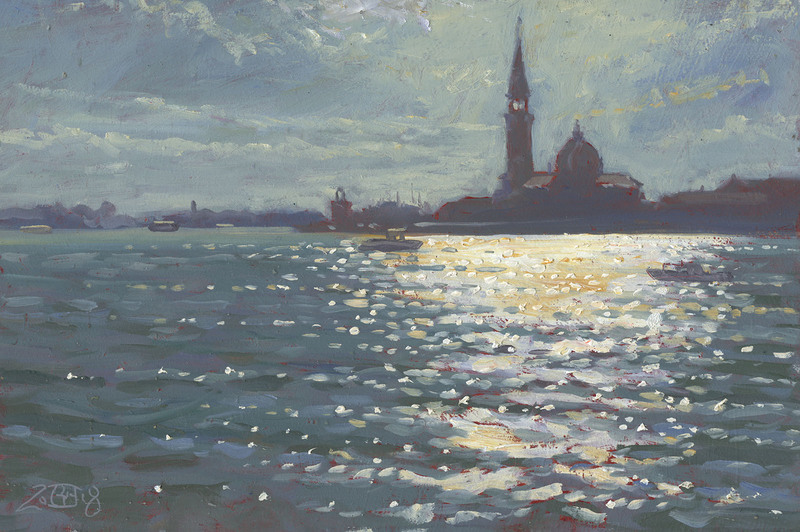 If the painting is too high a key is is impossible to describe the sparkle on the water unless you have neon paint! 12in by 7.5in Oils. 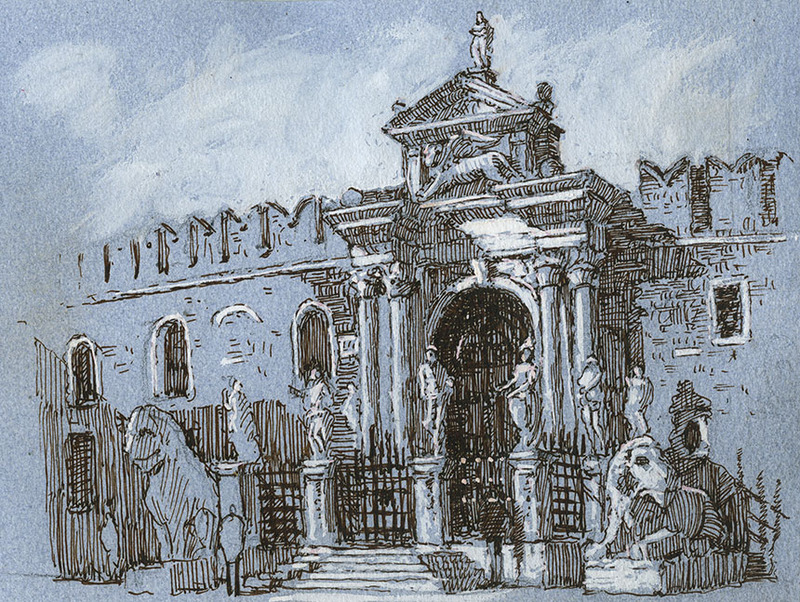 In the afternoon I went to the Arsenal, no not to watch the football, the Arsenal in Venice was the manufacturing powerhouse that maintained its naval dominance of the Mediterranean. In celebration of this they gave it grand gates flanked by comedy lions. Like so much of Venice it is hard to get exactly the vantage point you would like without falling into a canal and getting wet. 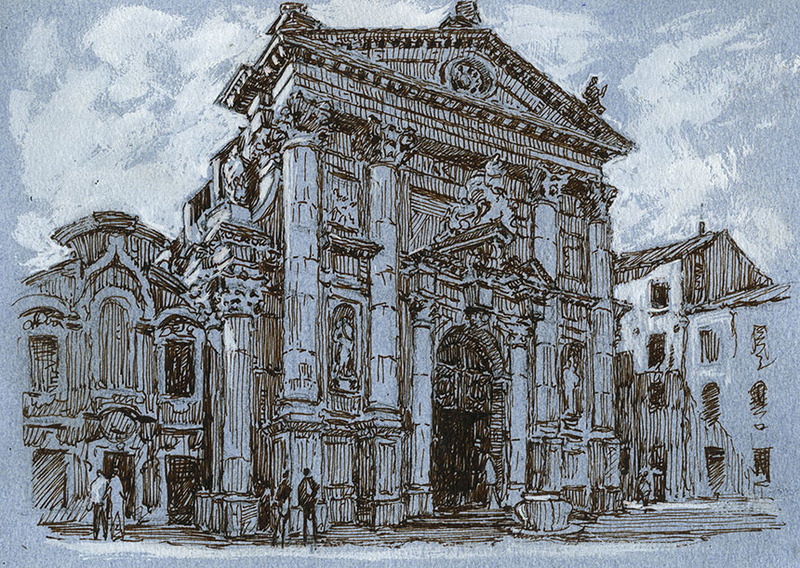 I should have done more drawing, the only reason I might return to Venice is to concentrate on the wonderful architecture. Pen and Ink. Mist! We got up early and the sea mist had come in transforming the city. 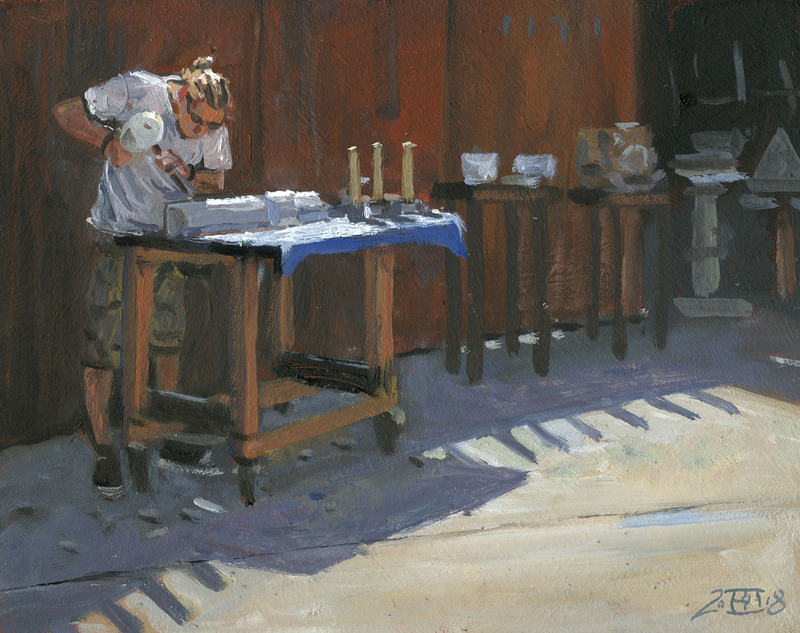 I was focused on the painting I imagined I would do after this one as the sun burnt through. A mistake as I abandoned this one early and it was better than the subject I was eagerly anticipating. 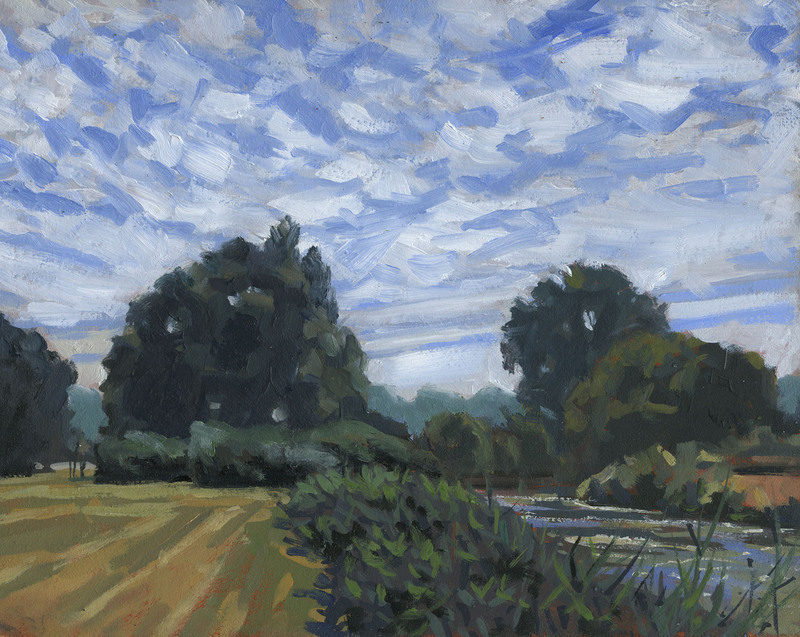 Still I had more than enough down and only had to finesse the figures and drag pale blue over the distance to finish. Once again control of tone was the key. 12in by 7.5in Oils. This is what appeared out of thew mist! I should have been in a different place about a mile away but I just had to set to and paint what I had in front of me. I never quite finished as the light moved on so rapidly. This one is no more as I painted a different one on top due to running out of boards! 12in by 7.5in Oils. I drew this as I waited for my expensive and badly cooked supper in a restaurant. As it turned out the passing mosquitos had a better meal than I did for no charge at all… Pen and Ink. My first canal painting. There are endless versions of the narrow canal with the thin vertical strip of light and reflection, but this was more open and attractive as a subject. 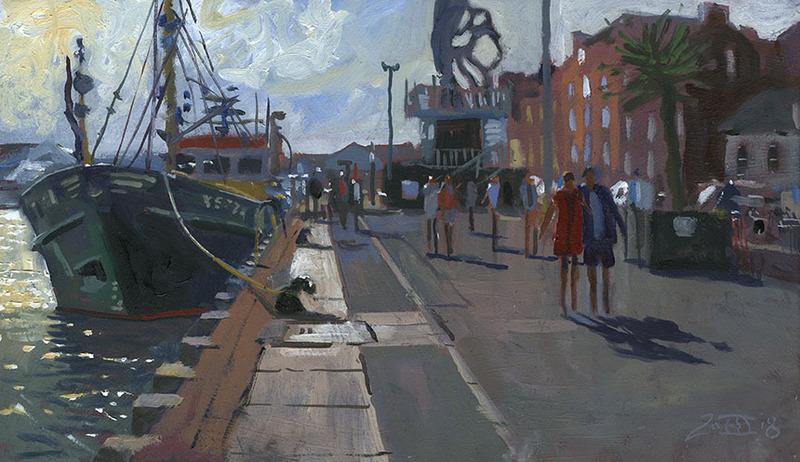 I placed the bright vertical strip of the canal edge first as I felt it was the key to the composition. In the bright light I found myself quite frequently putting in all the lights first allowing the prime colour to stand in initially for the buildings etc. I found myself using a lot of black in the mixes as it seemed just right for the character of the greys the city is steeped in. 12in by 7.5in Oils. 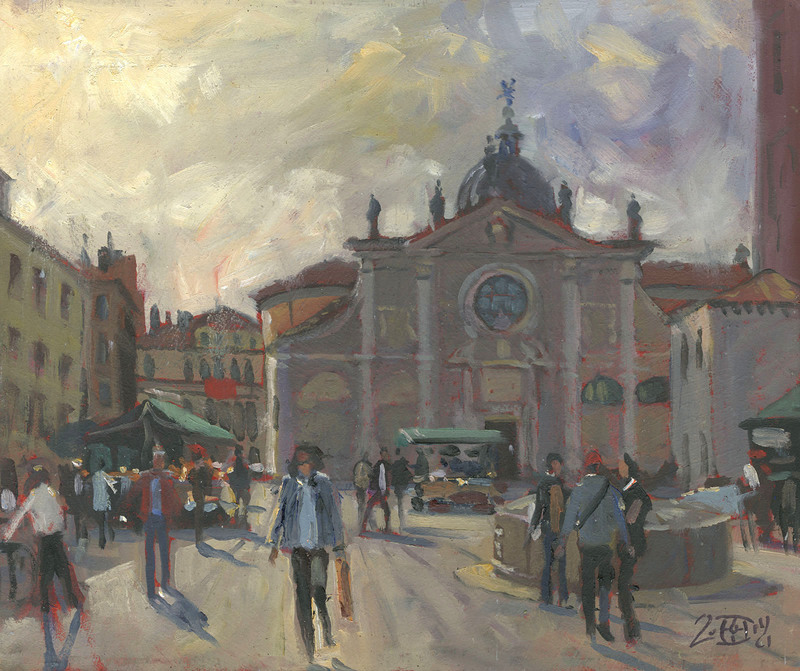 Later that day I painted in that famous stage set St Marks Square. The afternoon light was flat on the facades reducing them to cutouts. I was sitting on the arcade steps and painted hand held. I was lucky not to get moved on by the gestapo who strut about the square. I tried not to get too involved in the architecture as getting the tones right was the challenge. In the event I had to very slightly lighten the cathedral later in order for the whole thing to gel. 16in by 7.5in Oils. I decided the next day was a wandering about drawing and watercolour day. 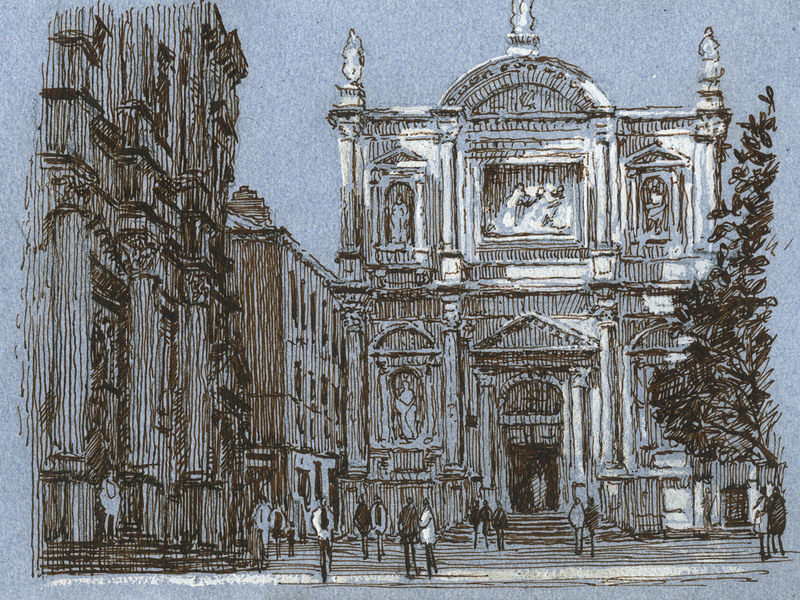 This is the Campo San Rocco… how could I resist the light slanting across this mad baroque confection. The school to the left is just as barmy but only plays a supporting role here. 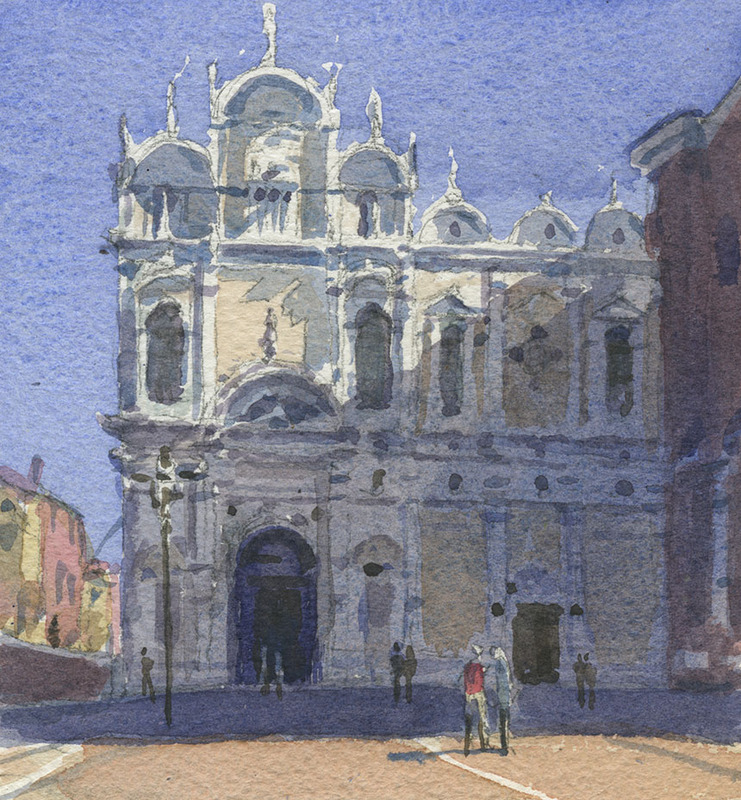 These wonderful buildings seem to almost never appear in paintings done by recent visitors. I suspect people find them just too much to take on. In actuality they are just divided rectangles, the complexity is not structural but an overlay on a simple grid. The trick is to firmly establish the underlying grid within which the decorative elements sit. Once that is done the mad stone salad of detail can be suggested rather than over defined. Pen and Ink. 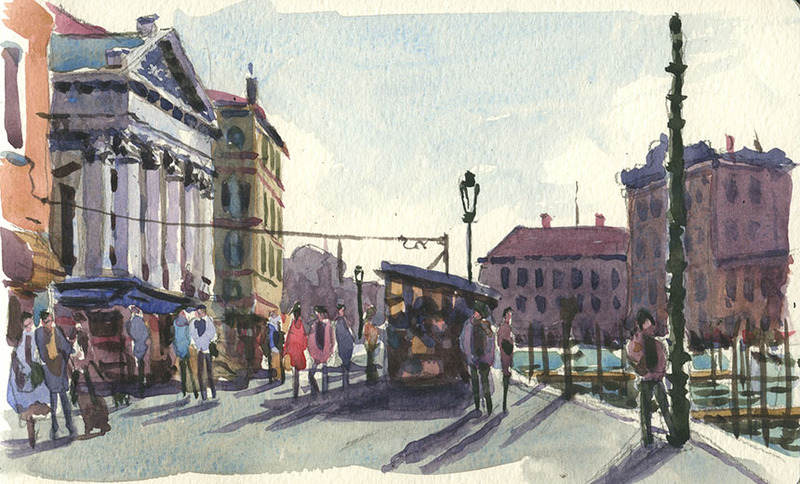 My first watercolour of the trip. Though the stalls are full of the worst tourist tat they make good compositional punctuation marks. Watercolour easily captures the luminous quality of the light. 7in by 5in Watercolour. 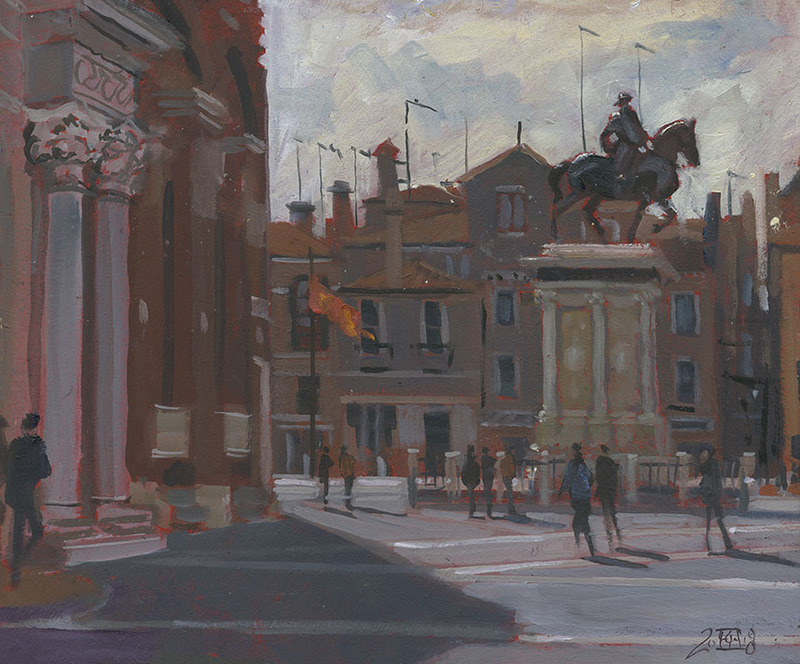 This is an early morning Campo Formosa, the light was a real challenge and I nearly abandoned it. As so often I found in Venice the people are the key to a satisfying composition. In each painting I found myself more and more considering the makeup and grouping of the figures. 12in by 10 in Oils. Next Campo! This is St Giovanni, one of the most interesting to paint. Odd how the old Venetians were not in the slightest bit embarrassed about putting up huge statues of themselves. Getting the horse in the right relationship to the rest and not over detailing were the biggest challenges here. Once again many of the greys were made using black. 12in by 10in oils. Another day another canal. Here is where they service the gondolas. In my jaundiced opinion they look better upside down! The thrown together industrial sheds make an interesting contrast with the grand edifices behind. Not far from here the mask shops dry up and the grass grows between the stones. There are run down tenements and washing hung between the buildings. This is where some of the workers live, though it is only the briefest fringe before the industrial port. 12in by 7.5in Oils. On the way back to the apartment I saw there two girls hanging out and doing phone stuff. They are students in the college on Campo Santo Stephano, a little glimpse of ordinary existence. Pen and Ink. 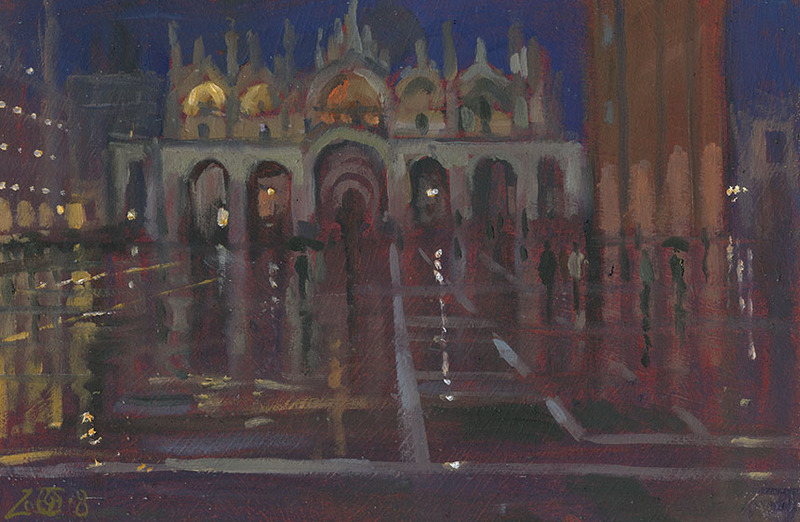 After supper it was nocturne time in St Marks. The wet paving made it a great subject. I rubbed violet blue over my board before leaving base which made a great ground, indeed most of the paving is just the resulting prime colour. Very quick hardly more than 20 min. 12in by 7.5in Oils. Another day where I just took my drawing stuff and travelled light. We all met at the Rialto fish market in the morning. It is very nice to have other painters about to chat and laugh with. I found myself a little corner to sit and draw out of the way. 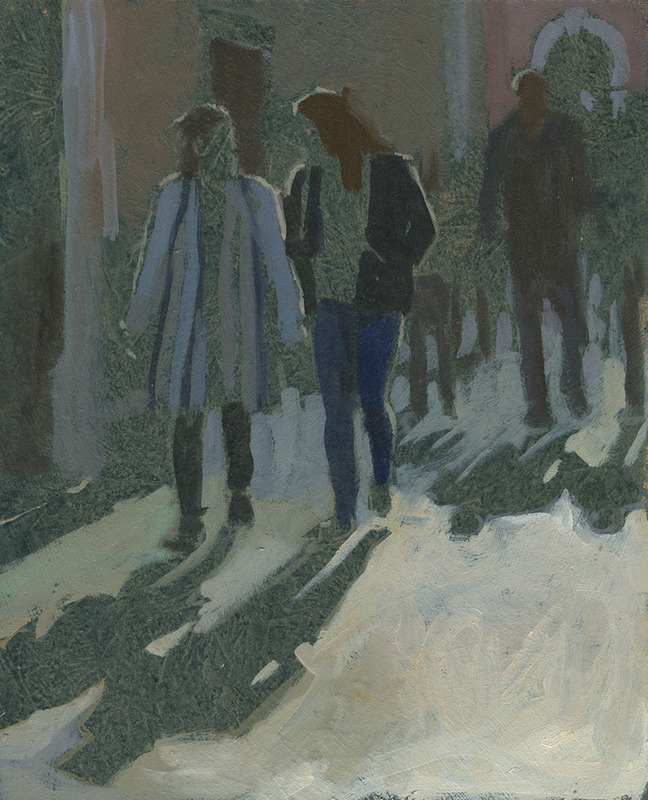 The light was moving very fast so the first thing after setting out the drawing was to get in the paving, shadows and key figures. I also painted in the white first rather than at the end as I usually do. This was a real help in getting the darks the right value. Pen and Ink. Deep breath before I started this one of St Stae. I am sitting as far away from the building as possible without tumbling into the Grand Canal… but still too close for comfort. To get what I wanted in I used spherical perspective so that few of the perspective lines vertical or horizontal are straight. 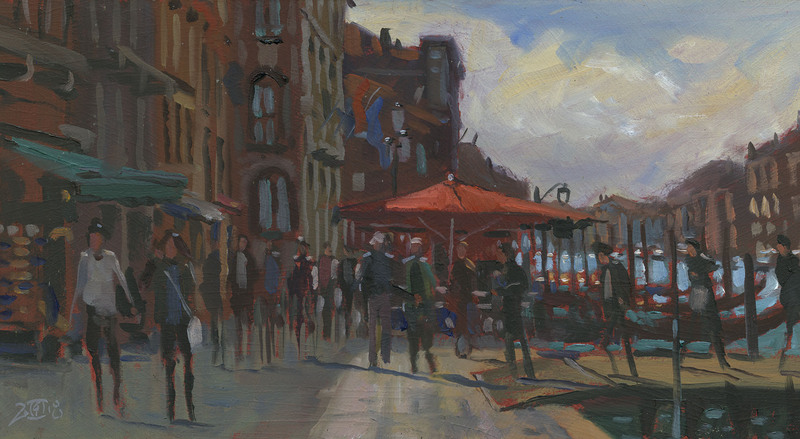 This sort of construction is very tricky to do en plein air especially as I don’t like it if the distortion is too obvious. I spent quite a lot of time getting the facade laid out, deciding what should be warped and what kept straight. A very satisfying puzzle though and I enjoyed trying to suggest the bonkers architecture. Pen and Ink. Santa Maria del Giglio and rain at last! 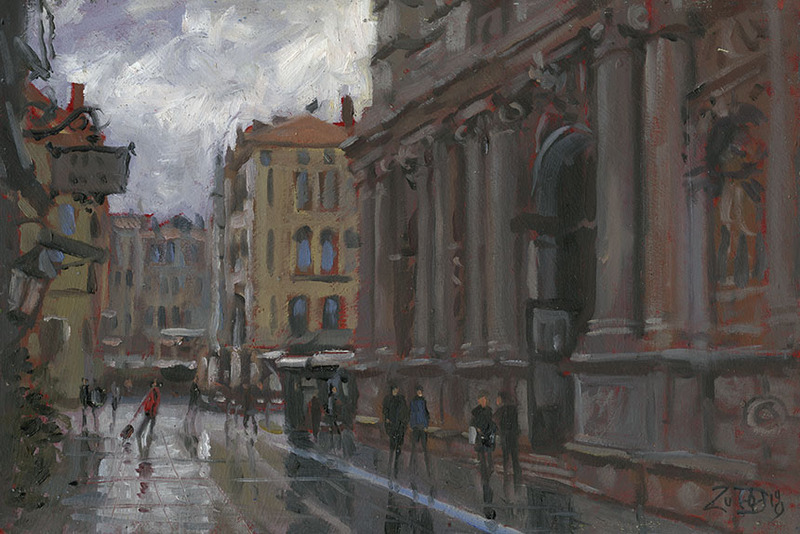 I had been dying to paint the wet streets. Also it sweeps many of the visitors away and those that are there are rushing to avoid the wet. I was in a discrete dead end corner so I could paint away at my leisure. A bit of a relief as most of the paintings so far had been a bit of a rush to catch the light. 12in by 7.5in Oils. Last one of the trip! This is Campo Santo Giovanni again. I loved the angled shadow but it moved very rapidly. Had to be watercolour as my oil boards had run out! I then proceeded to do another that went completely pear shaped and had to be torn up… 5in by 5in Watercolour. So there is my Venice. 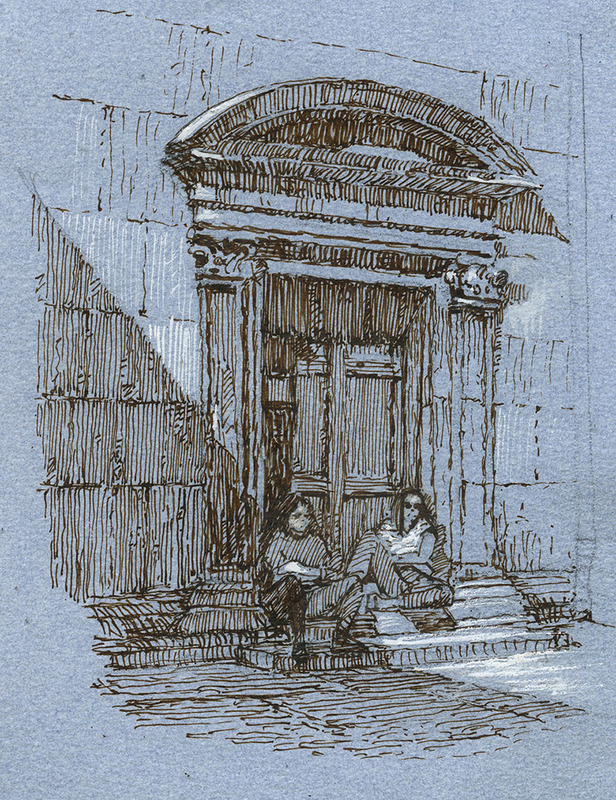 I might return to draw some of the buildings and I am glad I went and saw it all in the excellent company of my fellow daubers. Venice itself I found sad and defaced by the lazy, cynical, rapacious hand of greedy tourism. The mask and trinket vendors have done far more to besmirch this beautiful relic than any of the many graffiti artists have.